Whether your workout involves running, walking, sports or gym equipment, a decent sport shoe is a must. Injury caused by inappropriate shoes can needlessly derail your fitness or weight loss attempt. Investing in a quality shoe can help you to prevent foot and ankle damage, and make your workout a more pleasant and comfortable experience. A variety of sport shoes are on the market for every type of exercise. Running shoes that have inbuilt shock absorbers are available for joggers, and lightweight walking shoes are available for walkers. Aerobic shoes are lightweight and shock absorbing to prevent foot fatigue and to cushion the ball of the foot, which is put under pressure from aerobic exercise. Tennis shoes have flexible soles to protect your feet from the quick side-to-side movements of tennis. Thick-soled, high top basketball shoes provide extra protection against ankle and foot injuries caused by jumping. Cross-training shoes are also available. These are suitable if you perform a number of sport or exercise types in your workout. The American Orthopaedic Foot & Ankle Society recommends that the type of shoe you choose should depend on the sport you are most active in. If you perform a certain type of exercise three times a week or more, choose a corresponding sport shoe. 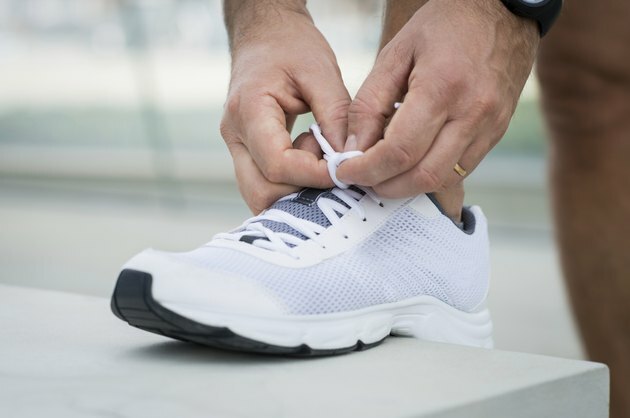 The McKinley Health Center recommends that you try on shoes in the afternoon or evening, or after your workout as your feet are largest at these times. Try the shoes on with sports socks to ensure a good fit and stand up when trying the shoes to make sure they fit. Leave a half inch between your big toe and the tip of the shoe and make sure you can easily wiggle your toes. Bend the shoe to make sure it is not overly flexible as this can indicate a lack of support. Choosing a proper shoe can help to protect you against common injuries associated with your type of workout. Good shoes can lessen the impact of your step and cushion the foot from heavy landings. In addition, sport or exercise specific shoes can improve your performance, enabling, for example, quick direction changes. Improper workout footwear can cause a number of injuries. Besides the more obvious injuries, including ankle strains and fractures, bunions and corns, some other lesser known injuries are common. Metatarsalgia, a condition which presents as pain in the ball of the foot, can be worsened by poorly fitting footwear, according to Beth Israel Deaconess Medical Center. Worn out sport shoes do not provide your feet with adequate protection during your workout. According to Michigan State University Extension, running shoes should be replaced after every 350 to 500 miles. If you run 20 miles a week, this means you should replace your shoes every 20 to 25 weeks. Netwellness advises against judging the wear of your shoes from the treads on the bottom. Instead, check the mid-sole of the shoe that will show damage sooner.